Playing Festivals, Concerts and anywhere fine live music is produced! 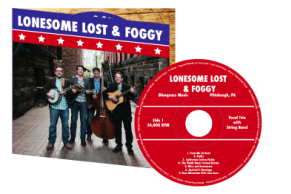 Lonesome Lost & Foggy's first album has been pressed and will be available for sale at future gigs, starting 10/29/2016. We will have CD release party in Mid-November. Stay tuned and as always keep pickin' and grinnin'. See full discography and details of the new album on our album's page! "Pittsburgh Bluegrass Bands are genuine elixirs for all those who wish to be cured by the saving grace of music!"